Burned house in Eringeti, eastern Democratic Republic of the Congo (DRC). United Nations Secretary-General Ban Ki-moon has expressed profound concern over reports of increasing political tensions in the Democratic Republic of the Congo (DRC) linked to the continuing uncertainty surrounding the country’s electoral process. In a statement from his spokesperson, the Secretary-General called for the “strict respect of the fundamental freedoms and rights enshrined in the Constitution,” urging all parties in the central African nation to exercise restraint and express their views peacefully, including in the context of demonstrations scheduled to take place tomorrow. The Secretary-General called on all Congolese political stakeholders to “place the interests of their country above their own by engaging constructively in a meaningful political dialogue aimed at peacefully resolving their differences,” according to the statement. 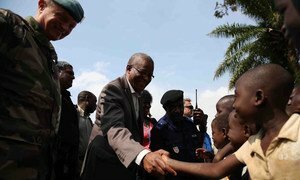 The UN chief also urged the political stakeholders to extend their full cooperation to the African Union (AU) Facilitator for the National Dialogue in the DRC, Mr. Edem Kodjo, and reiterated the full support of the UN for his efforts.